Scientists have discovered the chemical that makes naked mole rats cancer-proof, a finding that could eventually lead to new cancer treatments in people. 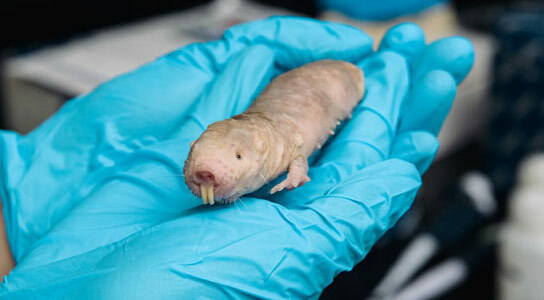 The biologists’ focus on HMW-HA began after they noticed that a gooey substance in the naked mole rat culture was clogging the vacuum pumps and tubing. They also observed that, unlike the naked mole rat culture, other media containing cells from humans, mice, and guinea pigs were not viscous. “We needed to understand what the goo was,” said Seluanov. Gorbunova and Seluanov identified the substance as HMW-HA, which caused them to test its possible role in the naked mole rat’s cancer resistance. Be the first to comment on "Scientists Discover Chemical That Makes Naked Mole Rats Cancer-Proof"